One of my most painful times as a parent was when my daughter was 2. She would scream when I left her at nursery in the morning. AND scream when I picked her up in the evening! Running round the room manically to get away from me. I felt heart broken and – if I’m honest – humiliated. But don’t worry – people said – it’s a terrible-twos thing. They struggle with transitions. She’ll grow out of it. And yes she did. Sort of. But in many ways, not. Our kids ability to cope with transitions is NOT just a developmental milestone. It’s NOT just something they hit and then they’re OK.
For some kids, transitions will always be hard. In some cases VERY hard. AND there’s one simple reason for that. Rapid transition – from one activity to another or one place to another – is at odds with those kids BIG, totally fantastic super power. And that super power? It’s focus. Some kids – even when tiny – have a phenomenal capacity to immerse themselves in one thing. That amazing ability to focus deeply produces brilliant scientists, inventors, writers, crafts people. BUT it makes growing up in a busy, busy world painful. In these times, we’re judged on the speed we switch from one activity to another and another. It wasn’t always so. It’s not the set-in-stone, natural way of the world. AND we must NOT condemn kids who struggle with frequent transitions as failures. BUT – in our increasingly hectic way of life – they DO need help. So, what as parents can we we do to help kids with transitions? Kids do have to make transitions throughout the day. They can’t build that tower, read Harry Potter, stay in the playground, all day. We do have to get dressed, eat meals, go to the shops etc. So we give them warnings don’t we? 5 minutes notice to come to the table. Or put their coat and shoes on. We all do it, but for some kids it doesn’t help. At all. Kids still feel they’re being wrenched out of a world in which they’re in full flow. We need, instead, to build a bridge out from where they are to the place we need them to go. Which means spending just a short time actually entering that wonderful space they’re in. Asking them about the tower, or where they’ve got to in Harry Potter. Or joining them on the climbing frame chatting about how much fun it is. When we make that real connection in their world kids are far more receptive to a verbal picture of the place we’re asking them to transition to shortly. That might all sound a bit mumbo-jumbo! But give it a go. Just be interested in whatever they’re enjoying before demanding they switch to something else! Unfortunately, kids will be judged on their ability to cope with transitions. 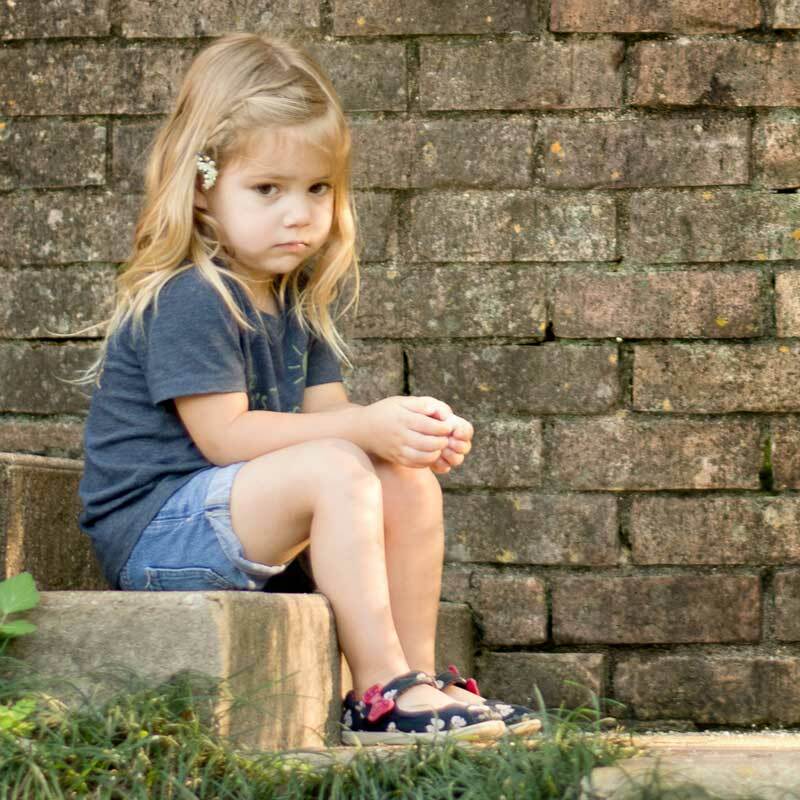 At nursery and at school, their struggles are easily seen as bad behaviour. Switching from lesson to lesson some kids never get into the flow of things all day. They can feel disconnected AND worse, like failures. So it’s super important at home to give these kids space to immerse themselves. With big chunks of schedule-free time. BUT as parents we also need to start talking to teachers and schools and educators about this. Where’s the time on the curriculum for the five year old who will happily spend two hours – without a break – expanding their already encyclopedic knowledge of dinosaurs? When does the 7 year old who can narrate every detail of the adventures of Odysseus – but struggles to complete quick worksheets – get to share their stories? How are the deep, specific skills of the 8 year old who will sew or knit for hours on end developed? How is the unbelievable ability of a 9 year old to remember a decade’s worth of sports results exploited in the classroom? Of course, it’s hard for teachers, shepherding 30 kids from one activity to another. They’re trying to cover so many different subjects. BUT we do need schools to champion focus and celebrate obsession and nurture them and NOT just reward flexibility and compliance with quick change. Now, we often hear that children flourish with routines. And yes, they do NEED repetition and predictable rhythms. But as parents we shouldn’t confuse that with a need for a strict schedule. Some kids who focus intensely, totally crave that strictness of time. But for others, who struggle with transitions, schedules are a disaster. For us, the answer has been a diary FULL of free time PLUS a loose rhythm of simple habits. These are the essentials – washing, dressing, eating. PLUS chunks of time everyday getting outdoors and doing very basic housework and cooking together. We’re also trying – more and more – to do a little thing everyday for someone else whether it’s write a thank you letter or pick up litter or share some love with the family. BECAUSE these habits are few AND simple AND we repeat them so often, they’ve become super easy for our brains to transition to, even when engrossed in Harry Potter Book 5! AND – very importantly – they’re the basic self-care and communication life skills our kids who struggle with transitions will need to keep stuff ticking over as they grow up. An easy rhythm to follow that will give them space to deep dive into and focus for ages on something amazing! 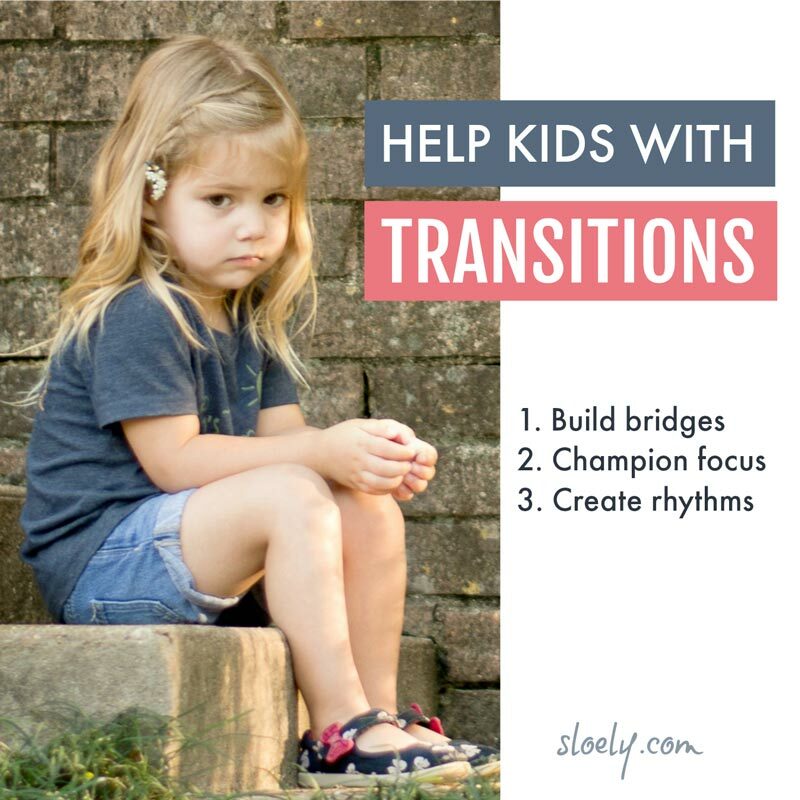 If you’ve got a child who struggles with transitions, I do hope this helps a little. Great to hear from you Basia. It is so easy to try and cram too much into the day isn’t it? I have found slowing down really helps me personally as well. I love this article, my DD has a tough time with transitions, and I am going to try the building bridges part. It is hard in this fast world, she takes a long time to do things. She is in preK, I can only imagine how hard it will be in KG.